This series is produced by Midea, the world's largest producer of major appliances. Midea has been creating commercial and residential air conditioning systems for more than 25 years, emphasizing--above all--affordability, durability, and quality, with particular concern for environmental stability and customer satisfaction. 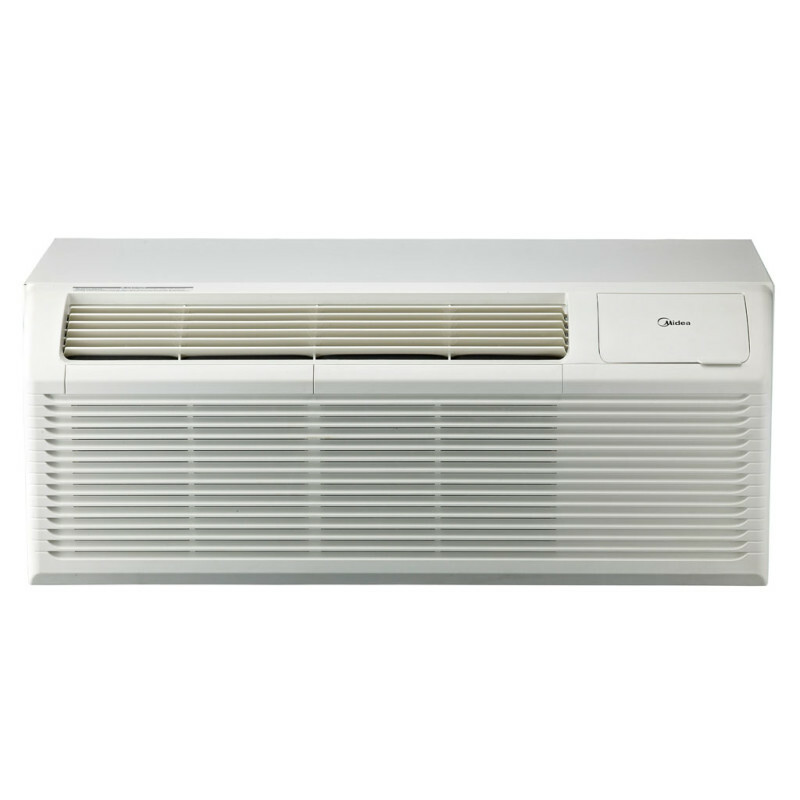 This Midea PTAC series offers both heating and cooling, with cooling capacity options of 9,000 Btus, 12,000 Btus, or 15,000 Btus. The units in this series are highly versatile for a variety of applications, with electric heat as well as heat pumps. In locations with more moderate heating/cooling demands, this heat pump is an ideal choice, as it offers an energy-efficient means of heating and cooling spaces. Whatever the season, use of the heat pump will help save you money while reducing negative environmental effects. This series offers many features that make its PTACs particularly useful and convenient additions to any space. For instance, auto restart means that after a power failure, there is no need to manually power the unit up when power is restored. Additionally, when dealing with low temperatures, this model offers automatic defrosting, which prevents the evaporator from freezing to extend the life of your PTAC. The series' dual motor design and durable chassis reduce disruptive sound during operation. Fresh air ventilation improves air quality by supplying the room with fresh air during use. The simple, clear controls offer LED and digital display and are entirely user-friendly; an optional wireless remote control further improves and simplifies the user experience and simplicity. If you're looking to upgrade your Midea PTAC, available accessories include a foldable wall sleeve, condensate drain kit, standard programmable wall thermostat, and stamped aluminum and extruded architectural grilles. Midea PTACs are also backed by a five-year sealed system warranty and a two-year warranty for parts and labor; with your purchase, you can look forward to having a quality, functional heating and cooling system for many years.